Real Madrid knock Manchester United off top spot as the worlds richest club! Real Madrid have leaped frogged Manchester United and regained their place as the World’s richest football club after the official Deloitte top twenty was released. 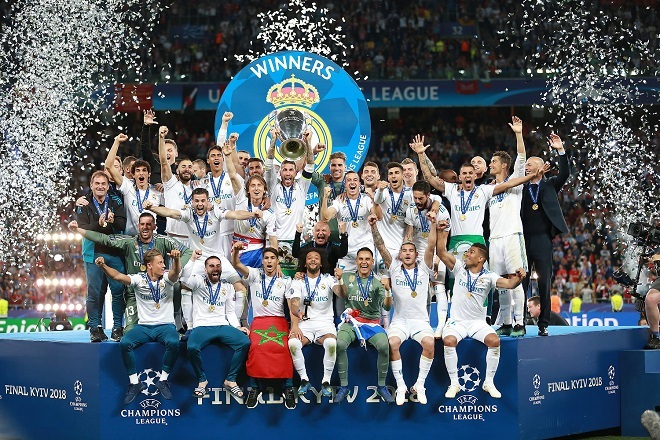 The current Champions league holders recorded record revenues of 750.9m Euro’s (£674.6m) in the year they won the Champions league for the third successive time, managing to hold off another La Liga club in the form of Barcelona who snatched second spot meaning it’s the first Spanish one -two since 2014/15 season. The list which contains teams from all of Europe’s top Five leagues, Spain, Italy, Germany, France and England is based all club revenue over the 2017-18 season. Despite not making the top two as Manchester United’s lack of silver ware as knocked them into third, there is a record number of six Premier League sides in the top ten of the lists as Germany side Bayern Munich cemented fourth spot while Manchester City took fifth retaining their positions from last year. The next five spots are dominated by the Premier League, although France’s richest Club Paris St Germain came in sixth who have moved up the table for the first time in two years after winning the French league and competitive performances in Europe. They were then followed closely by the remaining members of the Premier Leagues top 6 sides with Liverpool profiting greatly from their fantastic season in which they made the Champions League final, losing 3-1 to Real Madrid whilst also cementing themselves as true Premier League giants with one of their highest placed finishes for years. Next up is the top London sides Chelsea, Arsenal and Tottenham Hotspurs. For Spurs this is only the second time they have made the list in the 22 years it has been released, the only other time coming 11 years earlier in the 2006/07 season. Following on from that three more Premier League sides complete the top 20 with Everton named at 17th, Newcastle United 19th and West Ham United 20th. “The substantial presence of Premier League clubs continues to be felt in this year's Deloitte Football Money League”. Champions League draw see's Ronaldo return to Old Trafford. Could Ronaldo be on is way out of Real Madrid?